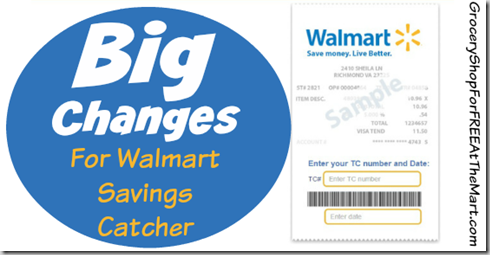 UPDATE:Walmart Announces BIG Changes to Savings Catcher! 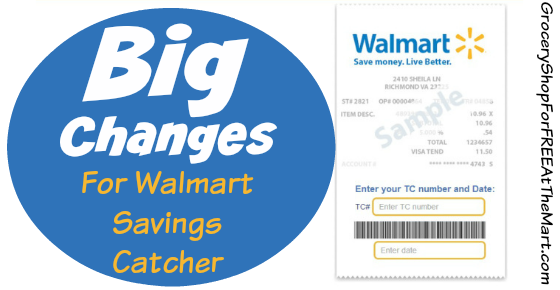 Walmart Announces BIG Changes to Savings Catcher! Walmart just announced some BIG changes to their Savings Catcher program! Starting tomorrow, February 14th, 2015, Walmart will no longer catch prices or items that generally do not have a like for like match at other retailers like bakery items or produce. In addition, Walmart will no longer include drug stores as stores they will “catch”. Now it should be made perfectly clear that you can still Ad Match these items at the register, they will just no longer be automatically “caught” by Savings Catcher. We haven’t heard yet what prompted these changes. I know I have really enjoyed getting money back on my produce as it seems I miss those deals more often than not. Perhaps it’s just a labor thing, they time and energy it takes to enter in all those different ads must be a huge cost. If anyone from the Walmart Newsroom team sees this, I think we would love to have a few questions answered for us. Can we expect more changes in the future? So far, every change to Savings Catcher has been to expand its scope and make it capable of catching more and more, this is the first time it has gone in the other direction. Can we expect more restrictions? Can we expect future changes to the the Ad Matching policy to bring it in line with these new changes? The new restriction on produce is the one that jumped out at me the most because they are like for like matches. Produce has the same PLU code across all stores. Does this change affect certain types of produce or is all produce off the table for Savings Catcher moving forward. And on a slightly unrelated note, when are we just going to be able to type our phone number in at the register and have our receipts entered automatically into Savings Catcher so we don’t have to scan anything anymore? UPDATE: I spoke to Danit Marquardt who is a spokesperson for Walmart and asked her the above questions. Here is what she gave me to share with you readers. · We are known for offering low prices that help our customers save money every day. It’s a reputation we’re proud of. · We’ve updated Savings Catcher to focus on grocery and consumable items that make up a significant portion of our customers’ weekly stock up trips, including pantry staples, dairy products like yogurt, cleaning supplies, health and beauty items, and over-the-counter medications. · Savings Catcher will no longer match departments consisting mostly of items that do not have a like to like match at other retailers such as produce and bakery items. · Additionally, we are limiting our comparisons to offers of other mass market retailers, grocery and dollars stores – where we know consumers often shop for stock up trips. We are removing comparisons with drug stores. Sooo…essentially no new information was added to the conversation. The one thing she said that I tried to push back on was she kept saying that produce didn’t have like-to-like UPC matches across different retailers. I pointed out that produce didn’t use UPCs at all unless it was prepackaged, (like salad mix or 5lb bags of carrots) produce uses the 4 digit PLU codes that are identical across all supermarkets. For instance, the PLU code for bananas is 4011 regardless of where you shop. For whatever reason, she didn’t seem to have an answer for that. The other thing I just could not get a clear answer on was why drug stores were dropped. I got the sense that they were removed because people generally don’t buy their groceries at a drug store but the list of what they wanted to focus on includes “health and beauty items, and over-the-counter medications” which are exactly what people go to drug stores to buy. I guess, the big takeaway here is that as soon as February 28th rolls around and our Savings Catcher money won’t get doubled by Bluebird anymore, we should probably get back to using Savings Catcher as a “safety net” for our weekly grocery shopping. W do all our own Ad and Price Matching at the registers and use Savings Catcher just in case it happens to find something we missed. Here are a few other posts that might interest you. These changes stink. Please provide a manual entry option.